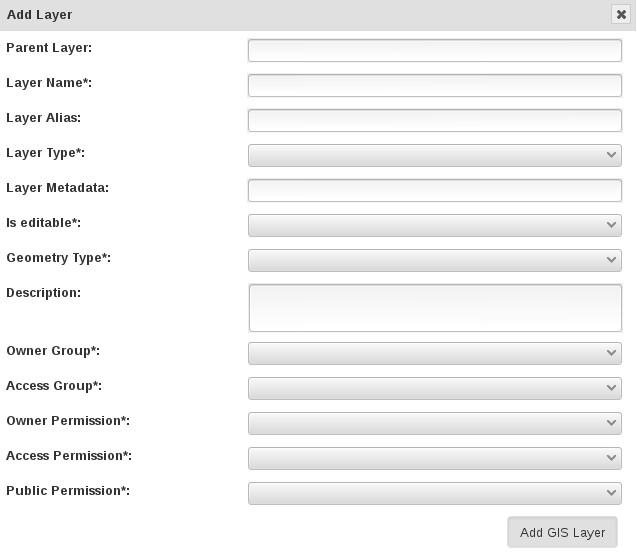 Layers refers to the data group that handles enviromental data. Layer can cover multiple locations and include multiple attributes for data collection. The following table lists all the actions that can be performed for the selected Layer in KDManage. Note: The presence of action types is dependant upon the Layer state - not all action types will be available for all Layers. To add a Layer select the Add Layer button to display the Add Layer window. Layer Name M The name of the Layer. A naming convention is suggested (e.g. a concatenation of site, type, date, number). Layer Type M Either layer, layer2d or layerimg. These three values refer to the base name of the real layer. Layer Attributes define the measurements that are collected in a Layer. For example: humdity. Users can define the size, type, unit name and any validation rule they require. 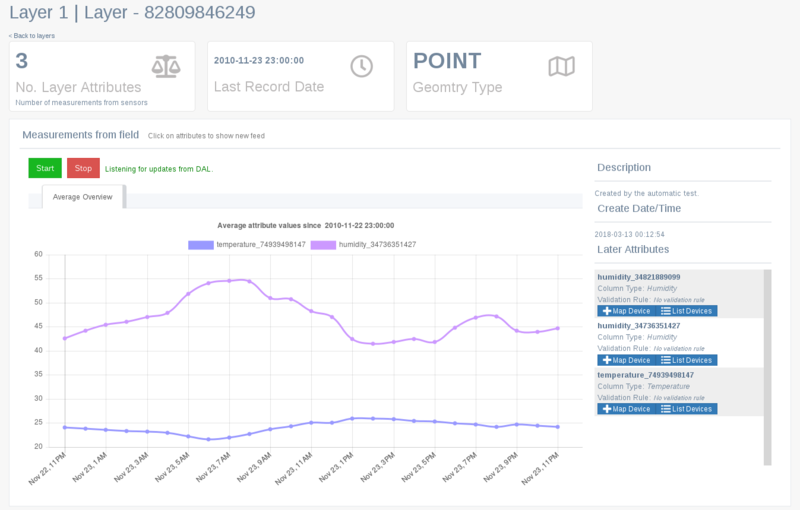 While most enviromental data will be uploaded via applications like KDSens, users can upload data via CSV through KDManage. For each layer attribute, users will need to include a column in uploaded CSV. All Layer Attributes in Layer Columns M Each Layer Attribute will appear as a field and users will need to specify each column in the CSV for each Layer Attribute. Users may not skip any of the Layer Attributes. Single Layers can be viewed as a single view which includes a live feed of the average Attribute values from a set time. The live feed of the layer data can be started by pressing (Start) and stopped by pressing (Stop). Devices can be mapped to an Attribute. This connects a device (usually a sensor) to a Layer Attribute to essentially specify which device is collecting data for an Attribute. To map a device to an attribute, press (Map Device) for the appropiate Attribute.